Standing cup; silver-gilt; chased; form of stag tripping; removable head; plain collar; oval stand embossed to represent surface of ground with snakes, armadillo etc; inscribed. Origin: Augsburg; late 16th century; mark of Christoph Erhart (master 1565, died 1604). Measurements: H. 11.8 in (30 cm); L. of base 9.2 in (23.4 cm); w. of base 4 in (10.2 cm); WEIGHT 984 g.
(i) Assay mark for Augsburg, after 1576 (R3 130) or, perhaps, Seling 16 (1585-90). (ii) The symbol incorporating the initials CE within a circular stamp: the punch-mark of Christoph Erhart (R3 366; Seling 763). (iii) The eagle displayed (?) - now an illegible mark. Finally, another illegible mark on the modern antlers is 'engraved in the form of a lion rampant' (Read 1902). Commentary: Christoph Erhart, who married Ursula Spitzmacher in 1565, the year that he became a master goldsmith in Augsburg, went on to have a successful career, gaining commissions from the Hapsburg Court for silver-gilt plate that was to form part of the Emperor's gift to the Turkish Sultan. One of the drinking-cups of fanciful form (a horse) is preserved in Kassel (see Seling 1980, fig. 159), while a beaker in the shape of a bird of prey's head is in the Hermitage in Leningrad (inv. no. 476; illustrated in Seling 1980, fig. 164). Although the treatment of the base of this Waddesdon example is competent, Christoph Erhart's embossed design is unimaginative; however, the inclusion of a creature that resembles an armadillo with a long tail is most unexpected. On the other hand, the attempt to incorporate a soaring mass of jagged rocks on either side is less than successful and not really suited to the 'ground' on which the stag is standing. Similarly, there is no attempt to show the long hair on the neck or chest of the stag and when the head is removed the fine tooling on the body is seen to peter out in an uneven fashion just below the rim. The collar, which is undecorated, has been added to the detachable head so that it covers the exterior of the lower rim in a neat and workman-like manner. The head is well modelled and the mouth is slightly open to show the teeth, in exactly the same way as on the very similar tripping stag cup preserved in the Schatzkammer der Deutschen Ritter Ordens in Vienna, which is known as the Zocha'scher Willkomm. This historic armorial cup by Melchior Baier of Augsburg (master 1576, died 1634) was listed in 1922 by Rosenberg (R3 384, c); it was made for a knight of the Order, Wilhelm von Zocha. The head and neck are sensitively modelled and chased, with long hair, but again the antlers are made of coral, which raises the question of whether the Waddesdon example could also have had coral antlers before the plain silver ones were added in the nineteenth century. Most noticeably, the Zocha'scher Willkomm has a cabochon rock-crystal set in its chest, just as on the famous Hermersberg Willkomm made in 1580-1 for Graf Wolfgang von Hohenlohe (see curatorial comment of WB.138 for a more detailed discussion); both rock-crystal cabochons protect the owner's coat-of-arms beneath. However, the base of the Zocha'scher Willkomm is remarkably similar in its form (with projecting narrow flat foot-rim) to the Tripping Stag cup in the Waddesdon Bequest, but in addition to the heavily embossed base (plants, rocks and creatures) there are several separately cast and applied creatures: a snail, a toad, a snake and a long-necked bird with its wings open and raised as if about to fly away. Furthermore, the collar around the stag's neck is equally richly ornamented with a series of bosses and finely chased borders. The stag by Melchior Baier, therefore, probably represents the best Augsburg work of this type in the early seventeenth century, and it is significant that this tripping stag by Christoph Erhart, though less ambitiously executed, shares many of the qualities and characteristics of the Zocha'scher Willkomm. Franz Schestag, ‘katalog der Kuntsammlung des Freiherrn Anselm von Rothschild in Wein’ Vienna, 1866, no. 210, with illus. Dora Thornton, 'A Rothschild Renaissance: Treasures from the Waddesdon Bequest', British Museum, London, 2015, pp.22-23. 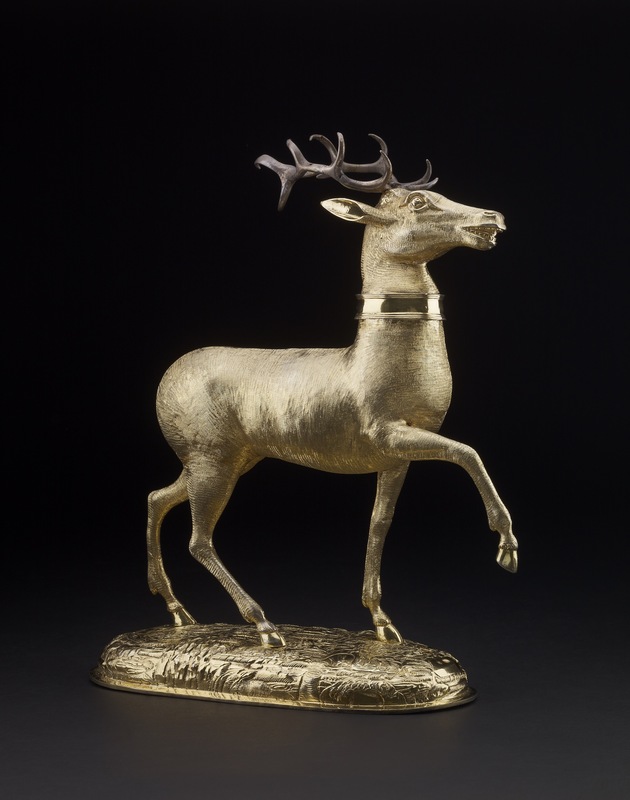 For a similar stag marked on the base for Christoph Erhart with a Rothschild provenance see Sotheby's sale 6 July 2010 lot 11 (in bibliography).